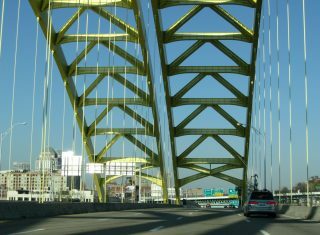 Initially opened in 1977, the Daniel Carter Beard Bridge carries Interstate 471 between Newport, Kentucky and Cincinnati, Ohio. 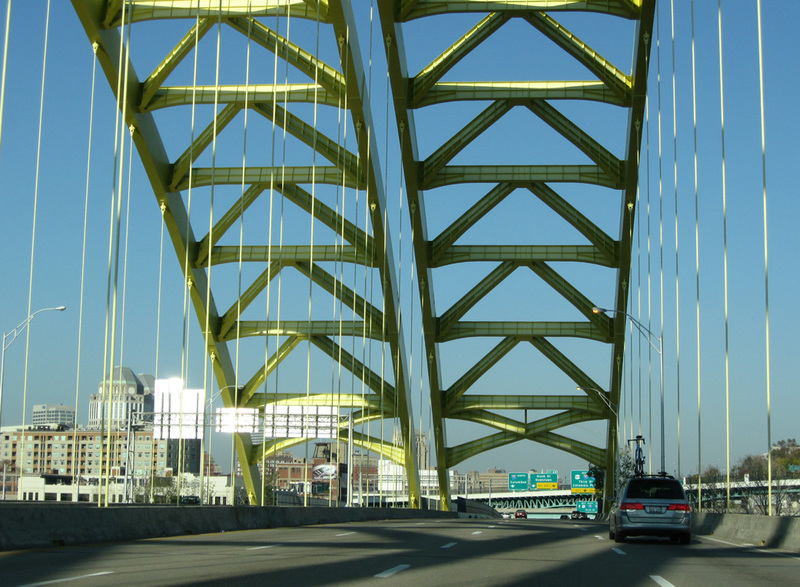 The Big Mac Bridge spans U.S. 52 above the north shore of the Ohio River in this scene. Photo taken by Steve Hanudel (07/03/06). Interstate 471 constitutes an urban connector linking I-275 (Circle Freeway) in Northern Kentucky with I-71 in Cincinnati, Ohio. The six-lane freeway winds through the suburban cities of Southgate and Fort Thomas and separates urban areas of Newport and Bellevue to the Daniel Carter Beard Bridge. The eight lane tied arch bridge crosses the Ohio River into Cincinnati at the Mt. Adams neighborhood outside Downtown. The Dan Beard Bridge was the only portion of I-471 under construction by 1973. Work further north was complicated by the landslide at Mt. Adams while the final alignment for I-471 south from Newport was still contested. 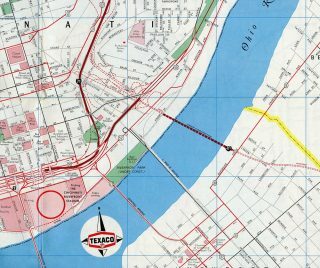 Note also that the Fort Washington Way section of I-71 along the Cincinnati Riverfront was drastically overhauled during a multi-year project completed in 2000. The entrance ramp from KY 8 (Dave Cowens Drive) from the Newport riverfront adds an auxiliary lane to Interstate 471 north across the Daniel Carter Beard Bridge into Cincinnati. Photo taken 11/08/09. Continuing from the Big Mac Bridge, Interstate 471 partitions into ramps for U.S. 50 (Columbia Parkway) west to I-71 south (Exit 6A), Sixth Street to Downtown Cincinnati and I-71 north to the Avondale and Walnut Hills neighborhoods. Photo taken 11/08/09. Exit 2 separates from southbound Interstate 71 for parallel U.S. 42 (Reading Road) and U.S. 22 (Gilbert Avenue) just ahead of I-471. Photo taken 11/08/09. A series of overpasses, including Elsinore Place and U.S. 22 (Gilbert Avenue), span I-71 south ahead of the wye interchange with Interstate 471. Photo taken 11/08/09. Interstate 471 branches south from I-71 at an unnumbered ramp to the Daniel Beard Bridge to Newport, Kentucky. I-71 lowers through the Lytle Park Tunnel ahead of the 3rd Street exit into Downtown Cincinnati. Photo taken 11/08/09. Westbound U.S. 50 separates with Columbia Parkway for 3rd Street into Downtown Cincinnati just ahead of I-471. 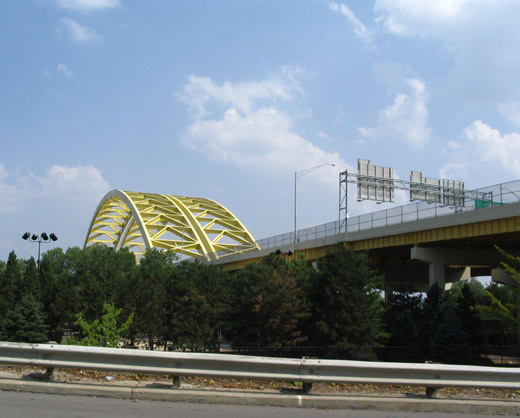 The parkway elevates along a viaduct west to succeeding ramps with Sixth Streeet, Interstate 471 south and Pike Street above the Lytle Park Tunnel (I-71). Photo taken by Shawn De Cesari/Dan Moraseski (11/01). U.S. 50 (Columbia Parkway) splits with I-71 north and connects with Interstate 471 south to Newport, Kentucky. Columbia Parkway continues east to Hyde Park and U.S. 52 by Cincinnati Municipal Airport-Lunken Field (LUK). Photo taken by Shawn De Cesari/Dan Moraseski (11/01). Fifth Street ties into ramps for I-71 north, I-471 south and the Columbia Parkway viaduct east to U.S. 50., these overhead signs show the lane allocations for the connection to Interstate 471. The preceeding left turn leads to Sentinel Street, which runs alongside the Proctor and Gamble buildings (this is a popular spot for news crews to do live reports on highway conditions during winter). Photo taken by Jeremy Moses (04/04/08). An S-curve leads Interstate 471 south through a valley betwen Wilder and Fort Thomas to the multi level exchange with I-275 (Circle Freeway) and KY 471. Photo taken 11/08/09. The succceeding ramp (Exit 1B) departs for I-275 west to Taylor Mill, Fort Wright and Cincinnati/Northern Kentucky International Airport (CVG). Photo taken 11/08/09. Interstate 275 winds west 8.6 miles from I-471 to the systems interchange with I-71/75 in the city of Erlanger. Photo taken 11/14/04. Left Exit 1A connects with Interstate 275 (Circle Freeway) east across the Combs-Hehl Bridge to California in southeast Cincinnati. Photo taken by Shawn De Cesari/Dan Moraseski (11/01). The zero milepost for I-471 stands at the entrance ramps from Interstate 275. Unsigned KY 471 extends 0.698 miles south to U.S. 27 at Highland Heights. Photo taken by Shawn De Cesari/Dan Moraseski (11/01). Continuing south on Kentucky 471, the freeway concludes at a signalized intersection with U.S. 27 (Alexandria Pike) north to Fort Thomas and south to Cold Spring. Photo taken by Shawn De Cesari/Dan Moraseski (11/01). U.S. 27 (Alexandria Pike) turns east at the south end of KY 471 in Highland Heights to Fort Thomas. Signage references Interstate 471 in place of unsigned KY 471 along the 0.7 mile link to I-275 (Circle Freeway). Photo taken by Shawn De Cesari/Dan Moraseski (11/01). KY 471 enters the four-wye interchange (Exit 1) with I-471 north and Interstate 275 (Circle Freeway). Exit 1A connects with I-275 east to U.S. 50, U.S. 52 and I-71 north to Columbus, Ohio. A left exit follows for I-275 west to I-71/75 at Erlanger and U.S. 25-42-127 (Dixie Highway). Photo taken 11/08/09. "I-471&apos;s birth slow to come – Plans and routes changed many times." The Kentucky Post (Covington, KY), November 30, 1998. "Change in direction: East-west route along riverfront once envisioned for Interstate 471." Cincinnati Post, May 9, 2005. "Mt. Adams Project Put on Hold – City Needs Approval of Next Governor." Cincinnati Post, October 25, 1990. "Holding Back Mt. Adams – Retaining Wall Needs Mending – Three Cables Have Lost Tension." Cincinnati Post, June 1, 1990. Dan Moraseski provided information regarding the establishment of Kentucky 471.